One of the most challenging things for a (new) teacher is planning and pacing the curriculum. After all, there are so many different standards to teach, practice, and assess, and so little time. Whether you teach middle school ELA or high school English at a school where you have a strict pacing guide or if you teach at a school where you have complete freedom in your planning, this is tough. I’ve taught in both situations, and each one has its positives and negatives. Regardless of how your school is structured, every teacher in every single classroom needs to plan lessons, activities, and assessments, and figure out how much time to spend on each one. Getting the timing of it down takes a few years, and pacing and planning is something that changes with every school year. 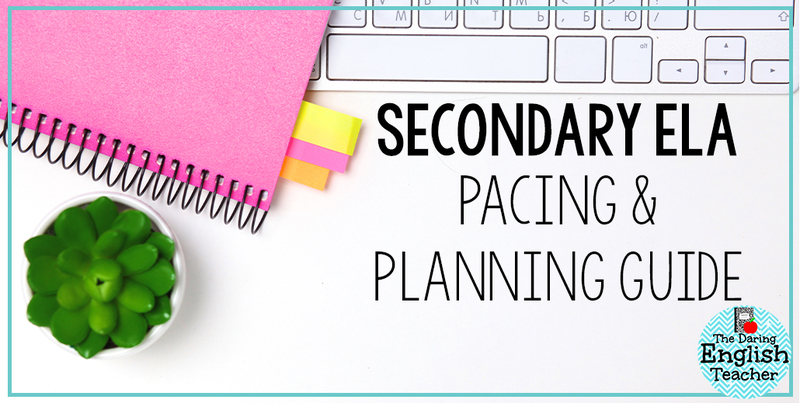 To help out teachers, I am sharing my secondary ELA pacing and planning guide with you. This pacing guide comes as a PDF download that also includes a link to an editable Google Doc. If you want to make this yearly pacing guide your own, you can edit your own copy of the document. While I do include links to paid resources, free resources, and blog posts in the guide, you can easily change these out with existing lesson plans and activities that you already have, or include my resources in your curriculum. I genuinely hope that this pacing guide helps you create a more robust, evenly paced school year. As a reference, I use this pacing with my freshmen and sophomores. You can download this free English pacing guide by clicking this link. Subscribe to receive updates from The Daring English Teacher. Thank you for subscribing! You will soon receive updates, freebies, and teaching ideas.